Recently I’ve been playing around with a new plugin for WordPress called Elementor. If you haven’t heard of this plugin it’s basically the newest, freshest way to edit your website in WordPress – and in order to understand why it’s becoming such a big deal you’ll need tou understand firstly how WordPress pages used to be built (using one of my favorite theme’s in-built editor – Enfold’s Advanced Editor) – how the market has changed and how WordPress has stepped up to combat these market forces. However what is important is to understand how (my) clients used to need to be able to edit their pages and how they can edit their pages now that Elementor is a core aspect of my tool kit (I’m going all in with the training on this). As you can see the Advanced Editor for Enfold – while still showing the text that can be edited – isn’t a WYSIWYG (what you see is what you get) type editor. As far as editing pages in WordPress has gone – there has been a couple of editors that have attempted to get as close as possible to being WYSIWYG without any really succeeding to the true nature of what a WYSIWYG editor is supposed to be. The closest plugin that has done this is WordPress Visual Composer – and even that was more complicated then it was worth – being in essence something that looked like a WYSIWYG editor without really being one. Now even though WordPress is the king of CMS on the internet there have been a number of players coming in that have been offering complete WYSIWY type editors on the market – notably Wix in the cheaper range but also sites like HubSpot/ClickFunnels which were more premium options. 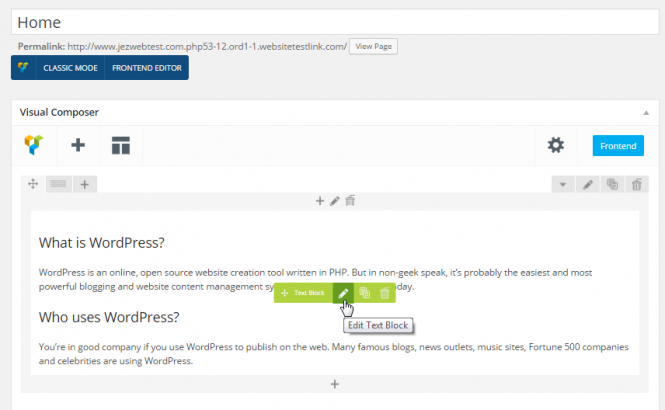 The technology was there but WordPress hadn’t picked it up in a major way – until now. The old Enfold way is cumbersome and still creates another layer between what you see on the final screen and what you’re editing – Elementor completely removes this. If you are editing a page built with Elementor you can edit it in real time – as in you will see what the end user sees as you make changes to it. While you’re not expected to learn everything there is about Elementor – what is great is that it’s so easy to pick up (just click what you want to edit and you’re away) – but also it’s very intuitive to learn. Many new clients have issues where their web developers are unavailable and they are completely lost in editing their sites and making required changes – with Elementor things become almost too easy (I could be out of a job soon 😮 ). All new sites that I create from this point forward will have Elementor Pro installed on them – and I will be moving to using Elementor exclusively for new sites – not only because it looks great but more importantly because it makes it so much easier for clients (and myself) to keep front end product pages updated.